Create geocode services on desktops and distribute them as Web services. Define the methodology used for matching with the address locator. The geocoding engine provides an advanced and reliable solution. The performance and accuracy rates of Esri's geocoding engine have evolved significantly in ArcGIS 9.2 and now match the leading competitive enterprise geocoders. This added dimension of ArcGIS enables users to fully customize geocoding applications and differentiates Esri's geocoding engine from other commercial solutions. The geocoding engine is a cross-platform technology that users can deploy in both desktop and server environments. With ArcGIS, users can also create geocode services on desktops and distribute them to be consumed as Web services. This integration of technology simplifies the process of customizing and distributing address locators to users throughout an organization. Customer and store locations as geocoded and displayed in ArcGIS Business Analyst. Two key components drive Esri's geocoding technology: the address locator and the underlying reference data. With the address locator, users can define the methodology used for matching, and the underlying reference data is a bank of information from which geocoding results are derived. The address locator, the primary geocoding tool in ArcGIS, refers to a geocoding rule base that directs the engine to perform address standardization and defines how an address is matched against potential records. Address locators contain geocoding properties and parameters, a snapshot of address attributes in the reference data, and queries for performing a geocoding search. When users create an address locator in ArcGIS, they must also specify the reference data they want to use for matching. 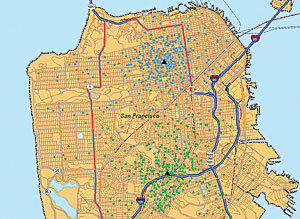 Primary reference data usually consists of street networks; however, users can also use parcel maps and other types of data, including data from commercial data vendors. Combined with commercial data, Esri's geocoding engine provides an advanced and reliable geocoding solution for accurate address matching. An example of Esri geocoding engine bundled with commercial data is the geocoder found in ArcGIS Business Analyst desktop software. In this case, Esri created a composite address locator that uses Tele Atlas/TomTom reference data in five participating locators: Address Points, Street Address Ranges, ZIP+4, ZIP Code, and City/State. The composite address locator aggregates multiple address locators within a single user interface and works in a cascading system, attempting to match an address at the highest-priority locator (Address Points), then moving to the next level (Street Address Ranges), and the next (ZIP+4), until a suitable match is found. Performance testing of speed and match rates recently conducted by Esri with a large file of U.S. addresses showed that the Esri geo-coding engine can process more than one million addresses per hour. 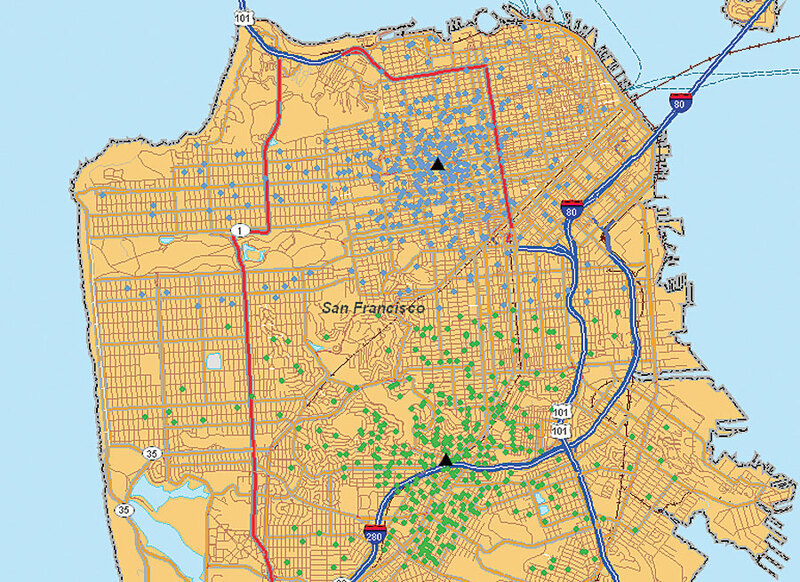 This test used a file of more than nine million addresses and matched 96.1 percent of the records to a street address range, 3.41 percent to a ZIP+4, and .40 percent to a ZIP Code. Only 0.01 percent of the records in the file remained unmatched. These results were approximately 2 percent better at the street level and 1.2 percent better at the ZIP+4 level than those of a leading competitive geocoder. For more information about the capabilities in ArcGIS, visit www.esri.com/arcgis.